What do you really know about your doctor? Is he just a nice genial person, a fellow golfer or crackjack surgeon? What really goes on behind the closed doors of the operating room? These are questions that thousands of people cannot answer, and most do not even know what questions to ask. As an insider in the world of surgery, I not only answer these questions, but I tell you more about the doctors of Cartagena, Colombia then you know about your long-term doctor down the street. These answers are more important than ever, now that our failing medical system is at a point of eminent collapse. Surgical specialties are particularly hard hit, as older surgeons retire with few new physicians choosing to take on the overwhelming responsibilities in a increasingly litigious society for less and less compensation. Surgical tourism is not the answer for everyone but it's certainly part of the equation and it might be a solution for you. For about 20% of the cost of treatment in the United States, with no waiting, patients can receive state of the art, boutique surgical care in new and modern facilities. 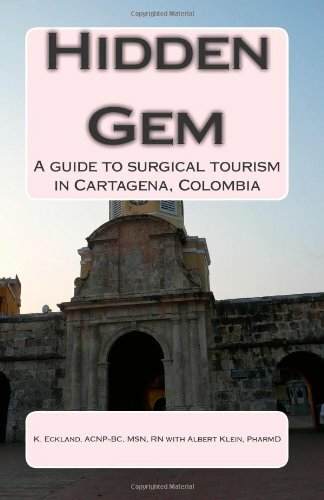 Hidden Gem: A guide to surgical tourism in Cartagena, Colombia answers all of these questions and more, while giving concrete, and detailed information to help plan your surgical trip. This travel sized book also provides general health and safety tips for prospective patients to prevent medical complications while travelling. Unfortunately, many Americans are unsophisticated when it comes to being savvy health care consumers. We pay far too much for far too little, with unrealistic expectations and mediocre outcomes. This book explains how to become a better consumer of health care services, and how to better communicate with health care providers. Kristin Eckland is a acute care nurse practitioner, in cardiothoracic surgery. Kristin has worked in cardiothoracic surgery in both academic and a smaller for-profit facility. In these positions; in both surgery and medicine; Kristin has had the privilege of caring for people during life-changing experiences; from diagnosis to discharge, and beyond. As a nurse, and patient advocate for affordable health care, Kristin has a special interest in the medical / surgical tourism industry. After noting a dearth of third-party information on medical tourism, Kristin became interested in providing objective, unbiased and useful information on medical services and facilities in other countries for Americans seeking health care abroad. With a background in sociology from Dalhousie University, in addition to a degree in Nursing from Vanderbilt University, and several years experience, Kristin understands the fears, concerns and problems facing today's health care consumers. In her role as nurse practitioner; patient educator and advocate, Kristin is passionate about providing people with information and options. As a nurse practitioner in cardiac surgery, Kristin has seen what can and does go wrong in the world of surgery and acute hospitalization. In her career, she has both treated and prevented catastrophic, and other complications from surgical procedures. This is her first, but not her last book. Revised August 2011.